ok, let’s just say that i took some liberties with the recipe. instead of cooking chicken thighs and seasoning them, i used a rotisserie chicken from walmart. why go through so much more trouble when you can get an already-cooked chicken for pretty much the same price? plus, rotisserie chickens are yummy. 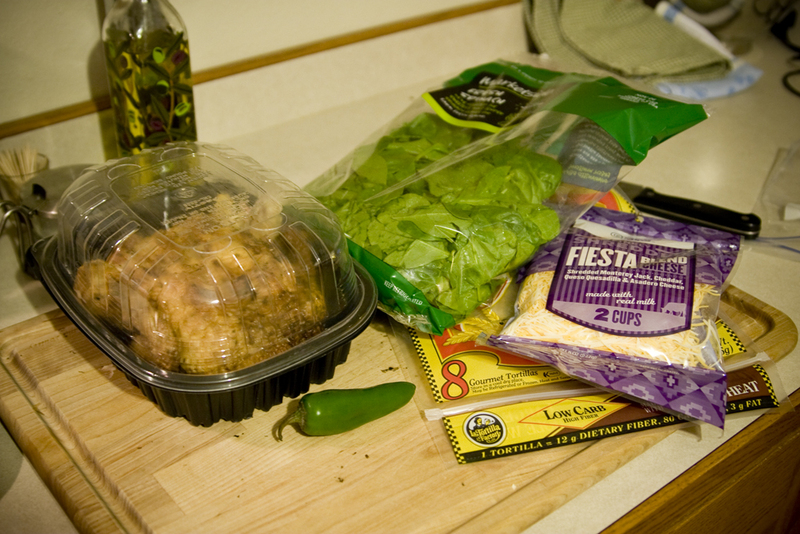 the recipe calls for chicken, spinach, tortillas, jalapeño and cheese, then baked so it’s healthier. as you can see, i got low-carb tortillas so they were even healthier. ok, i can do this. 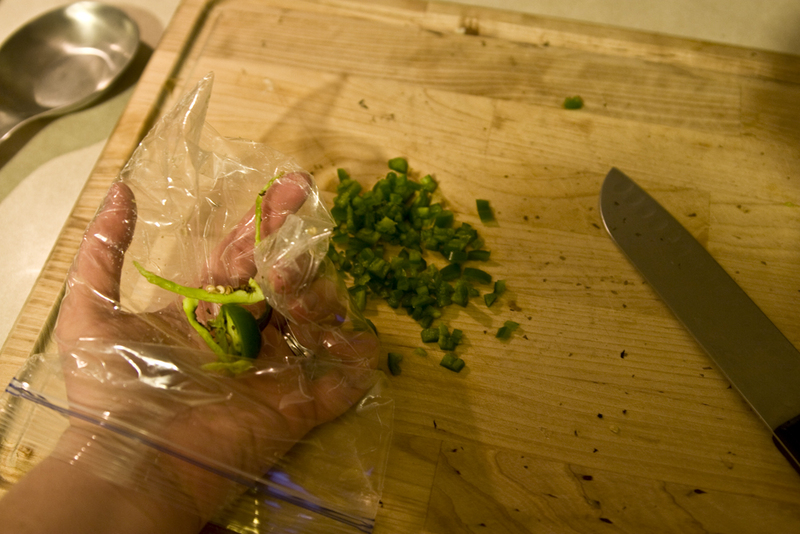 first, i warmed up my pan with some olive oil, chopped the jalapeño and threw the spinach and jalapeño in the pan. plus it makes for easy cleanup! 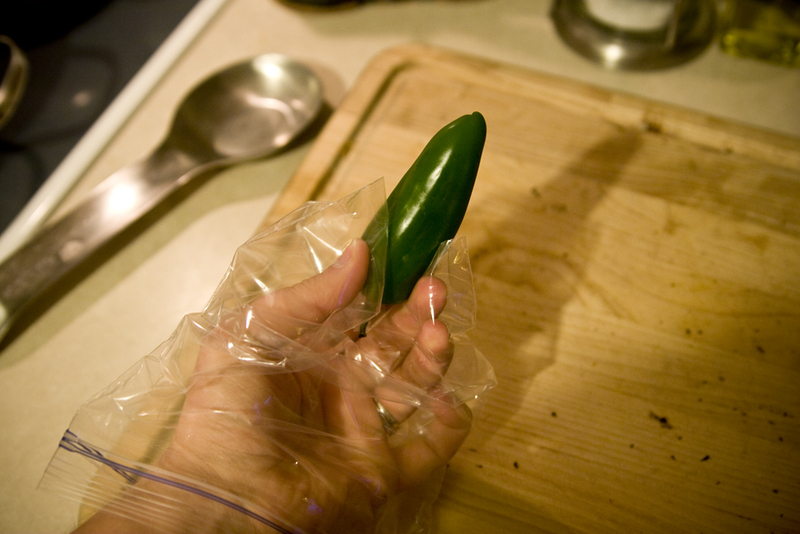 just grab your pith and seeds (the stuff that really brings out the hotness) and pull the bag over your hand and into the trash! 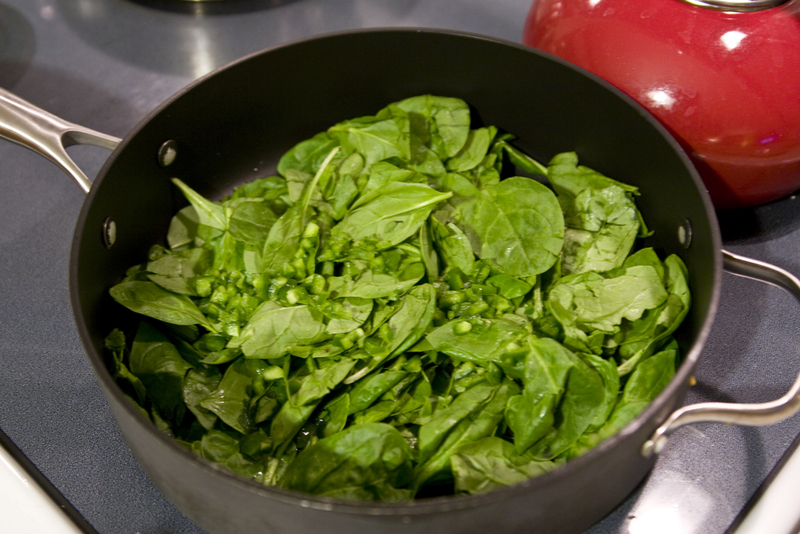 i threw in twice as much spinach as is shown. the stuff really cooks down. 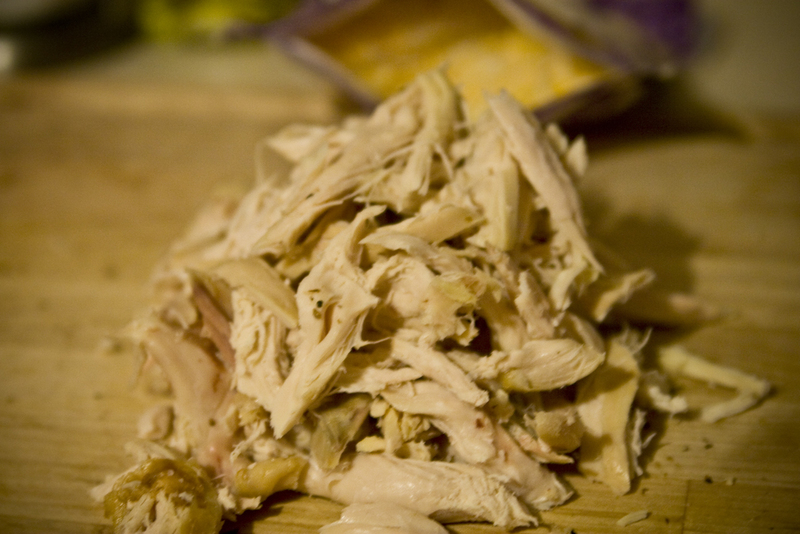 while that cooked down, i shredded the chicken. lots of chicken! 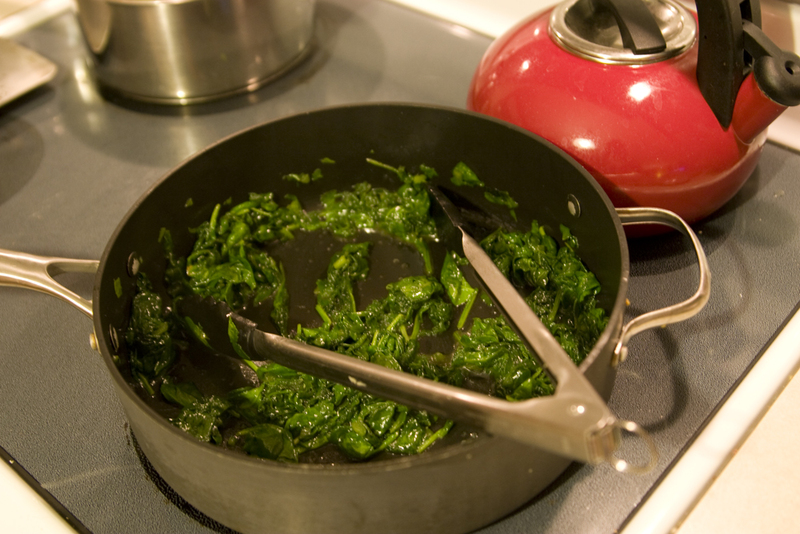 by the time i was done with this, the oven was preheated (to 450 degrees) and the spinach was done. ok. assembly time. tortillas get cut in half, and then it’s time to put in the stuffing. now, i don’t know if my tortillas were too small, or if i put in too much filling, or if i just have clumsy man hands, but my tacitos were a little overflowing. 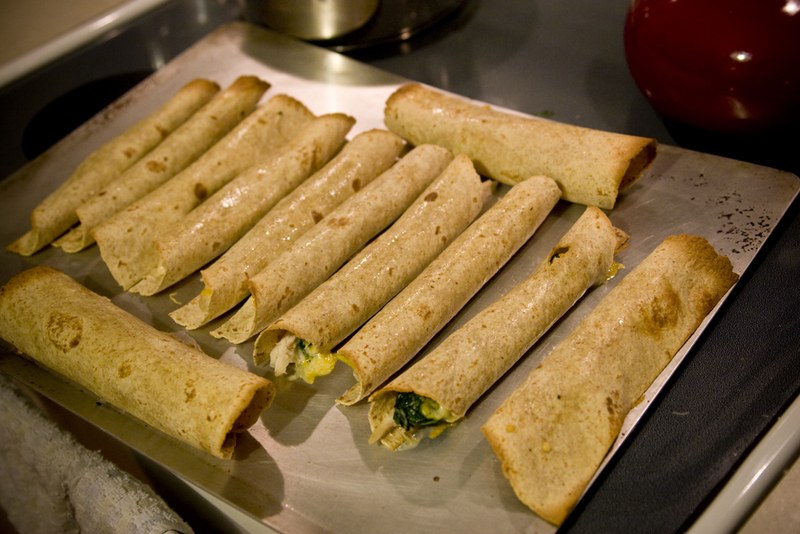 who wants a tacito with a single shred of chicken, two little shreds of cheese and one spinach leaf? not me. see how the filling is outside the tortilla? ugh. 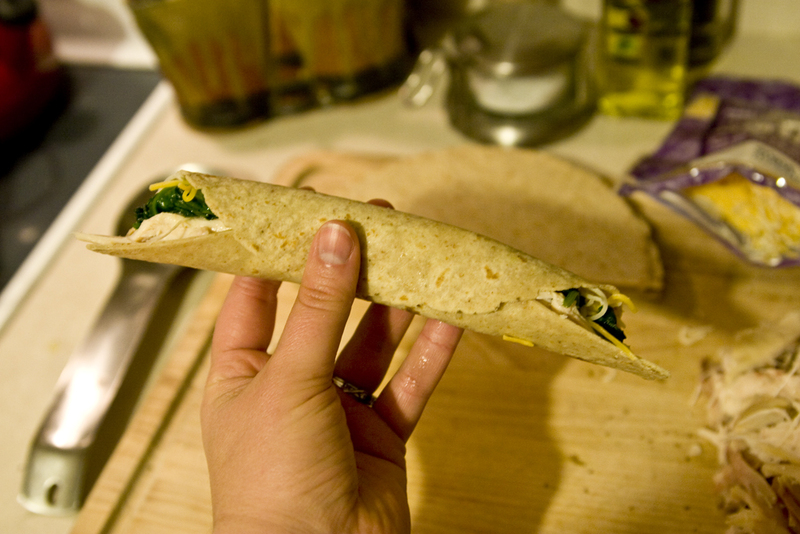 after i had used the called-for 10 tortilla halves, i had some filling leftover, so i made big burrito tacitos. onto a baking sheet and spread with olive oil. 10 minutes in the oven. as you can see, a couple of them opened up during baking and got their guts spilled all over. not cool, tacitos. not cool. BUT they were yummy! i’m not a huge fan of the tortilla in general, but when it’s fried or baked, i can handle them. the filling was yummy, the crispy edges of the tortilla were yummy, and it was an overall yummy experience. and low-carb, to boot! in the long run, they were kind of like making cake balls. a whole lot of work for a yummy outcome, but does the work outweigh the result? i’m not sure. plus, the end result was iffy with the tortillas busting open. cosmetically, they weren’t the best. but they are a yummy, healthy snack.